I added some strategies to portfolio and then I got to one which just wouldn't add. I then tried to add a couple of other strategies and they added okay and then I finished optimizing another strategy and added and nothing happened. They weren't duplicates. Oh that's strange. I just returned to the computer after an hour and it shows it's now been added. This is really ruining my experience as a new user. I'm spending a lot of time selecting strategies testing them for robustness, optimizing them, only to discover they won't be accepted into the portfolio. I click the button and nothing happens. Yet I can scroll down to another strategy that I wouldn't accept and add to the portfolio and it's accepted. I don't know what's going on. Does it have something to do with the correlations filter. It must either by the Correlation Analysis or by filtering. 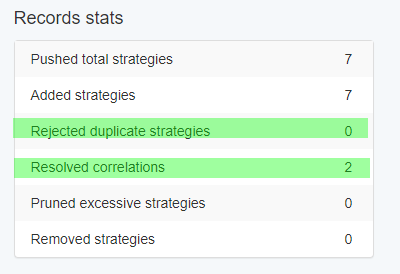 You can see the rejected equal strategies and resolved correlations in the stats panel. Is there a way to upload a Portfolio (instead of collection and not vial validator because it delete some of my EA)? Because with a Portfolio, I can identity and delete unwanted EA (via Meta Editor) and I want to reload the portfolio to EAS (to see the remaining selected EA I want to keep) in order to merge the EA from multi portfolios into 1 portfolio. Thanks for that. I thought that was the case. I'm still in a learning phase. It is set to automatically filter correlations and I've just discovered that the number can go down as well. I had 4 in a portfolio and I just added one and the number went down to 2. I can't decide whether it's better to switch it off and then apply the filtering when I've got enough in the portfolio.